THOUGH MISSING ONE EYE, SHADOW HAS SO MUCH LOVE TO GIVE. Shadow is a calm, outgoing and independent girl who is eight years young. She will eagerly come to meet you, and is quick to rub up against you for pets and attention. She has previously lived with children and done well with them, she avoided the family dog in her previous home and ignored the other cats. She is missing an eye but has no associated medical needs, and does just fine without it. Shadow is declawed in front and will need to be an indoor only kitty, and she is happy with that idea. 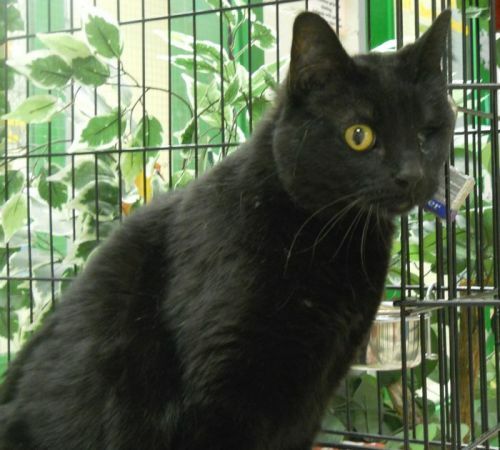 Shadow is an affectionate, quiet kitty who is looking for someone to love in a forever home. If that could be you, please come and meet this beautiful girl!